one fragment with holes for sewing, presumably of a rib. Part of the hull of the Skeppargatan boat seen from the outside. Note that even the ribs are sewn, not lashed to the strakes (Cederlund, 1978). Flank-stitch-wedge system of the Skeppargatan boat, (Cederlund, 1978). Clinker planking was sewn with spruce withes -- twisted spruce roots(?) approx. 15-20mm thick and 2m long. Though, such thik withies could be just twisted stems of young spruces 1-2 meters high, and not roots. ( see pictures: stitch 1 (43.5Kb), stitch 2 (24Kb);). Holes were bored obliquely and stitches were sunk (almost completely) into grooves between the holes. Withes were wedged in the holes with pine treenails, for caulking tarred moss was used. The material of all parts is pine wood, for the planks logs 25-30cm in diameter were split into halves, out of which planks approx. 4-5cm thick were carved very roughly -- actually, natural round surface of logs was left at the edges of all planks. Radiocarbon test indicated less than 250 y.o. 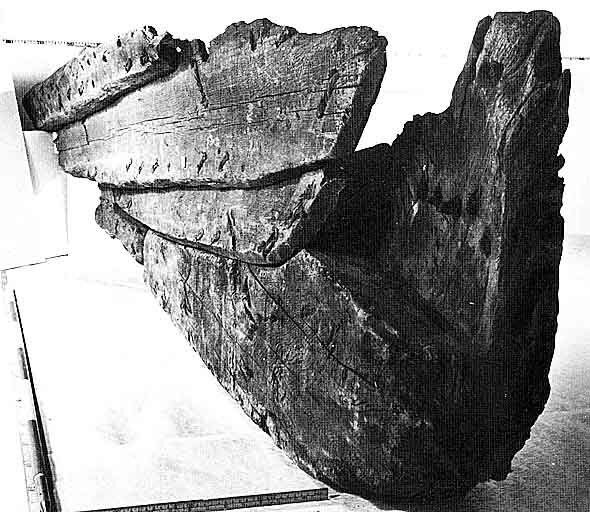 which put the date of building at around year 1700; analysis of pollen from different tree species (samples were taken from moss caulking inside the seams) shows that the ship was probably built in Eastern Baltic region, Russia or one of the Baltic states. Most of the remaining seams in the fragments are still strong and sound, which proves that sometimes sewing could be as good as metal fastenings, if not even stronger. See also reference to the paper. Cederlund, C. 0., 1978, Ett fartyg byggt med syteknik. En studie i marinarkeologisk dokumentation. Statens historiska musem (National Maritime Museum) rapport No 7. Stockholm. The 4. Skeppargatan boat.